Californian Democrat Rep. Eric Swalwell, the guy who threatened to use nukes against American citizens over guns, has just released what he claims is a death threat issued to him via voicemail from a pro-NRA man who opposes his gun control platform. However, there are a few potential problems with Eric Swalwell’s claims. The voicemail, published on Twitter by Swalwell, includes a dial tone and the sound of the caller dialing a number before the voice message begins. After the brief voice message, in which a male voice threatens Swalwell, the caller hangs up and the sound of a dial tone is heard. When you receive a voicemail, you dont hear a dial tone and then the sound of the caller dialing your number. Nor do you hear a dial tone when the caller hangs up. Go listen your own voicemail if you want to check what they sound like. Has Rep. Eric Swalwell created a hoax audio? Is this another leftist hoax crime? It would certainly make sense. 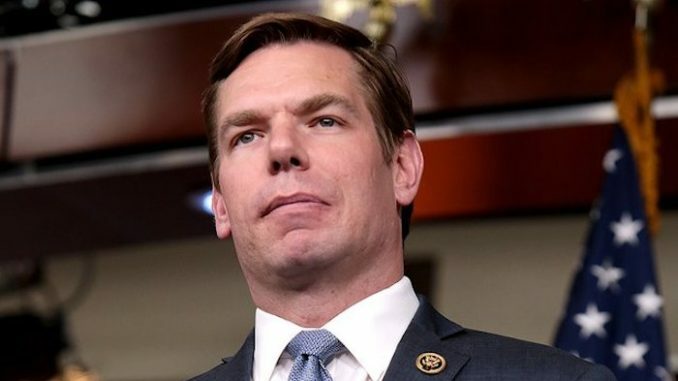 Eric Swalwell is set to announce that he is running for president in 2020 with a campaign focused on gun control. The 38-year-old is expected to declare during an appearance on CBS’s The Late Show with Stephen Colbert, where he will be joined by Cameron Kasky, a survivor of Parkland mass shooting, according to the Atlantic magazine. Is there a better way for an outsider to enter the race than with a hoax hate crime that garners sympathetic media attention from the mainstream media while smearing his enemies? A member of Congress faking audio death threats and publishing them on twitter in order to push an agenda should be a crime. He should be investigated immediately. Is this the sloppiest political hoax crime since Jussie Smollett was mugged by two Nigerians and decided to claim it was two white men in MAGA hats?